I’m not sure where my mind was yesterday, but I sure had a dickens of a time sewing together this simple signature block. When I was calculating yardage and the number of HSTs I would need to make a 24″ square finished pillow, I totally forgot that the plan was to set the HSTs on point! The photoed piece is measuring 24″ top to bottom, which means I will have to add a bit of a border. Or, maybe not, will half of an inch matter when stuffing the pillow form into the pillow case? It will be 24″ square once I trim off the HSTs on the sides. Feel free to leave your opinion in the comments on whether I should bother adding a tiny border to this piece. Would you add one, or not? There is a red t-shirt that I am to use for the back of the pillow. I also forgot to buy velcro for the closure. To prepare the block for signatures, I will press a fusible interfacing on the back side of the HSTs block. I’ll use Pellon P44F, which is the weight I like for t-shirt quilts. The fusible interfacing will add just enough stability for writing with a Pigma Micron pen, but will also leave the pillow soft and comfy. 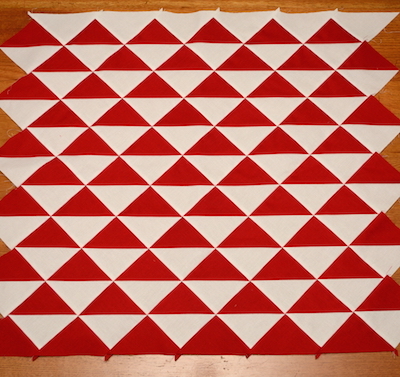 I’ll quilt in the red triangles, or maybe in the ditch using a white thin cotton batting. I have scraps, so not sure of the brand name and will back the quilting with muslin. Once the pillow is complete with a t-shirt back and black piping, it will be washable and durable. I pre-washed the fabric, so there should be no color bleeding, always a fear with reds. 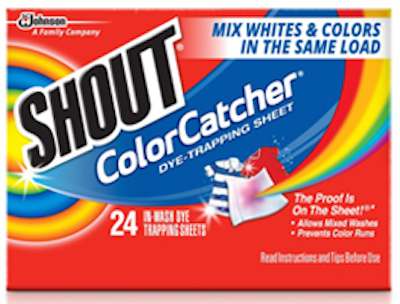 I will instruct the owner to always wash in cold water and to use a Color Catcher to be on the safe side! Today was another Curvy Quilters sewing day! I worked on a UFO, the Timeless Traditions BOM. I finished the 2 – 6″ blocks and 1 – 12″ block for month 6. There are 7 more pieced blocks and 4 appliqué blocks to complete before setting them all together. 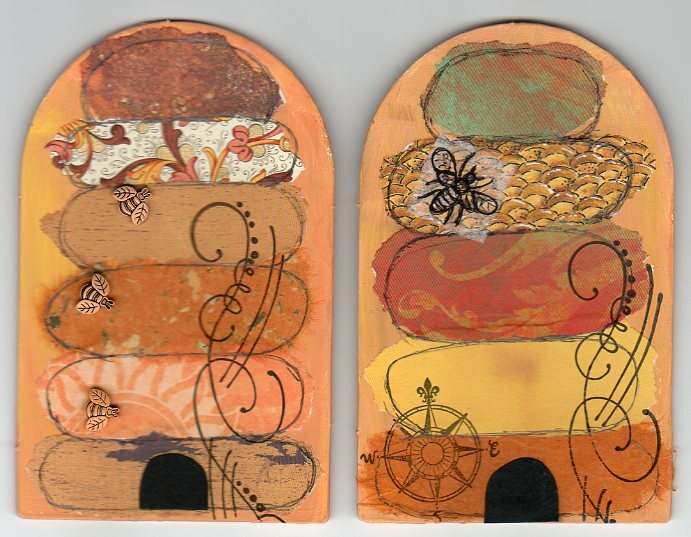 Then borders and more appliqué. I hope to have this quilt finished for a Christmas gift. I told my Curvy Quilter friends we need to meet more than once a month so I can finish this quilt! This is my 16 month old grand daughter learning to drink from a camel water pack! 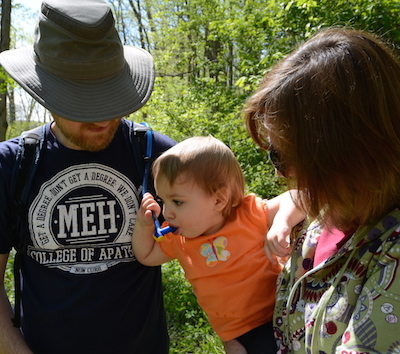 We had a delightful walk at a state park Sunday with most of our adult children joining us. But this is the only picture of the youngest in the family with her dad and me! I don’t know why we didn’t think to stage a decent family photo! How did I do on last’s week To-Do List? Hobo bag made from t-shirts. ✗ Didn’t get to it. HST signature blocks – 24″ pillow with t-shirt back. ✔︎ Pieced! Setting aside Bargello to complete #1 & 2. Might get back to Bargello if time allows. If so – borders! 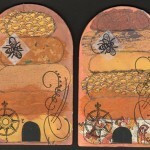 Work on BOMs, Timeless Traditions, Machine Quilting Block Party, One Block Wonders if time allows. Simply spray some Barbasol on to a plate. Add a few drops of the inks in different colors. Use a toothpick to swirl the inks around. 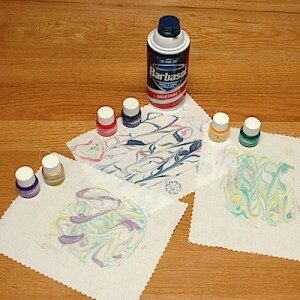 Lay PFD fabric on top of the shaving cream and ink, lightly press until you see the colors coming through the fabric. Peel fabric up off of shaving cream, lay on flat service and wipe off shaving cream with an old credit card, ruler, or squeegee. Allow to dry and then heat set with a hot dry iron. Your fabric is now ready to use a a project! I used the fabric to make these needle cases. Aren’t they cute!? Cut your marbled fabric into 2- 3 1/2″ x 5″ rectangles. You will also need a thin piece of batting that size. Layer the fabrics right sides together and place the batting on top. If you want the ribbon ties, cut two pieces each 7″ long. 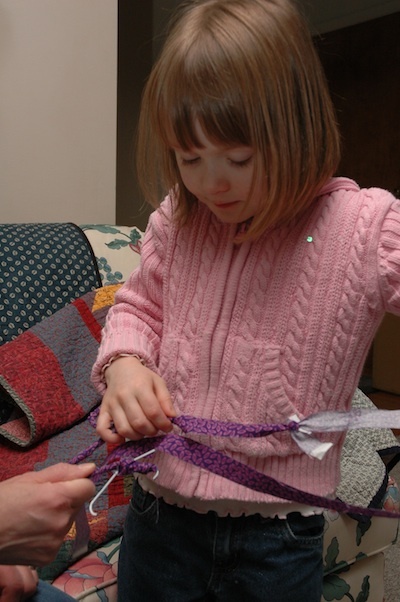 Pin the ribbon between the two layers of marbled fabric at the ends with the ribbons in the sandwich, making sure not to catch the ribbon in any stitching other than on the two ends. 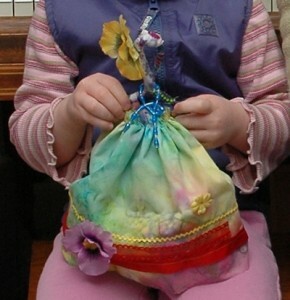 Stitch 1/4″ around the four sides of the layered fabrics and batting, leaving about 2″ opening on one long side. Trim corners. Turn the needle case right sides out through the opening. Press the opening seam allowance in 1/4″ and then top stitch around the needle case 1/8″ from edge. 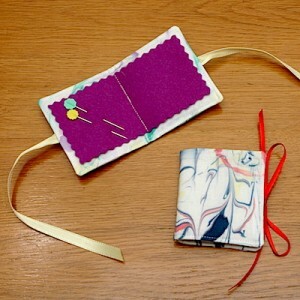 Cut craft felt or wool felt about 1/4″ smaller than the needle case. I used a pinking rotary blade for a decorative edge. Line up felt in the center of the needle case and stitch through all thicknesses down the center of the case, which will be the spine of the needle case. I hope you enjoyed this little tutorial and find time to play with some fabric marbling! Have you ever used PFD (prepared for dyeing) fabric or inks? What did you make? I’m linking to Stitch All The Things To-Do Tuesday. 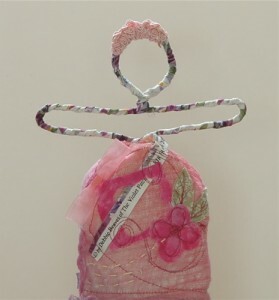 This week I plan on working on Dance of the Dragonflies, and cleaning out my sewing room. to have grandchildren visiting! I have not entered the wonderful world of grandmother-hood yet. 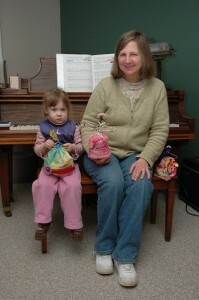 But this past Tuesday I had the delight to have two little girls visiting while their mother ran a few errands. The first order of the day when these little ones visit is to play with my cat. He soon scooted off to my studio and the “grand chase” was under way. Note that this is all normal behavior at our house! My cat loves to be chased and will keep the game going much longer than I care to play! The girls can stay interested in this activity about as long as the cat is willing to play! On this particular day, once in the studio, this little doll caught the eye of my 5 year old guest. 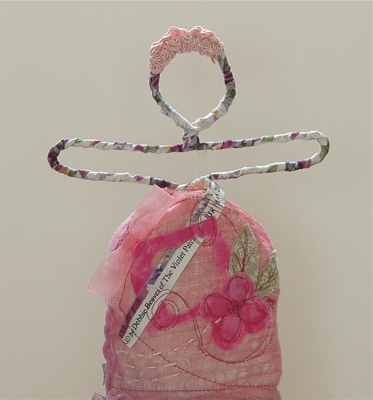 We wrapped fabric strips around wire bodies, sewed up dresses, and embellished them with all the goodies the girls selected for their new dollies. 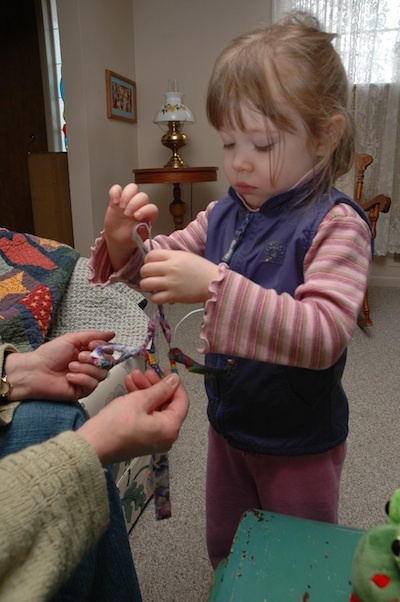 For the rest of their visit, the sweetie pictured played with the three art dolls, her older sister moved on to a doll house. And I watched them play while reading my new Cloth Paper Scissors magazine. These two very creative girls come by it naturally as their momma, Lisa Ransom Smith, is a Pastels Artist. Crafting has been slow in my life lately. Seems most of my time is taken up in the life of my teens – new school year and all. Volleyball games and such, all fun! 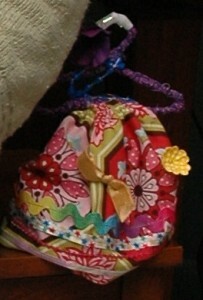 I did work on this canvas bag with the theme of Raggedy Ann and Andy. (Sorry the picture is not very good – it is a scan not a photo.) 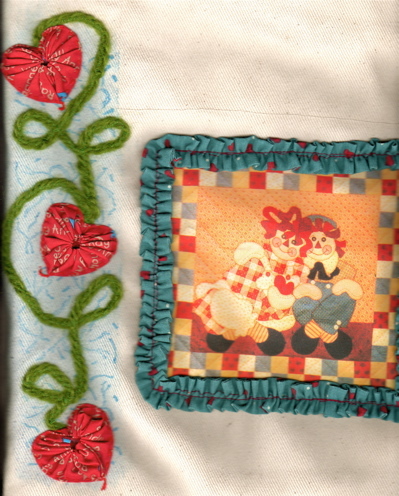 I added the yo-yo hearts, wool yarn vine, couched over stamping and fabric painting. I’m new to yo-yo hearts and I found them easy and fun to make using Clover’s heart shaped quick yo-yo maker! I tacked them down with red embroidery floss. (Have you seen Calamity Kim’s amazing yo-yos?) I stamped the background with Fabrico craft ink in Cerulean Blue using side B of Stampendous! Texture Cube. 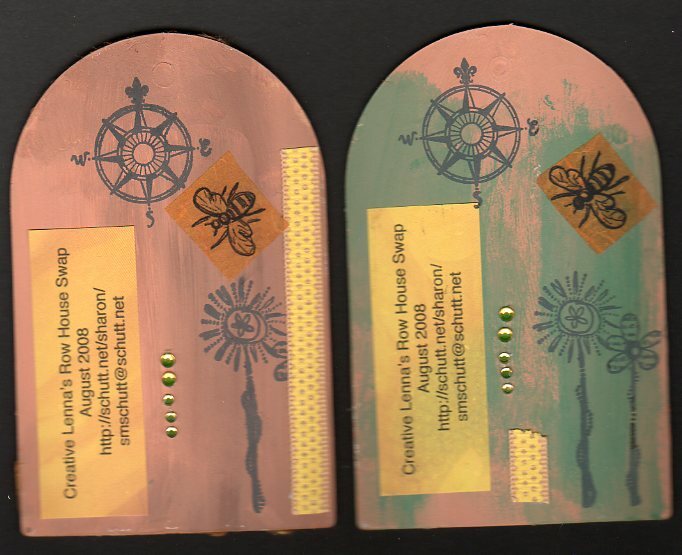 Once dry, I color washed over the stamping with Lumiere Pearl Blue. Next I couched the yarn in place using the zig zag stitch on my sewing machine and then added the yo-yos. I’m also working on the binding for the quilts for my parents (two twin size his and her quilts.) And having been inspired by Kim, I’m going to do more work on the yo-yos I’m sewing on to my mother’s quilt. 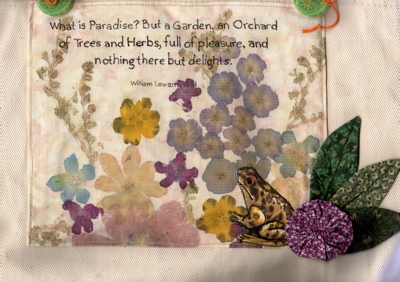 I’m just stitching them in place now along with leaves around an appliqued vine. But I plan on going back and stitching them around the edges with floss. Don’t think I’ll add beads as it is a bed quilt intended for daily use. Thanks Kim for the inspiration! The theme for this bag is ‘travel.’ Mary included photos and tickets printed on fabric of trips she has taken since childhood. 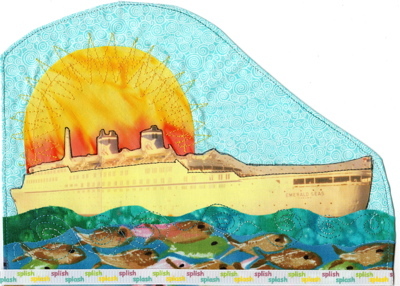 I picked the photo of the cruise ship and had fun layering it with fabrics and ribbon. I used fusible web and did some free motion stitching to hold the piece together. I outlined the ship with a Pigma pen and also did some stitching in a dark grey thread to add detail. This is what the piece looks like before adding it to the canvas bag. I have a tag that says ‘enjoy the journey’ that I hope to fit into the piece. It might have to be sewn on to another place on the bag as it is getting crowded! 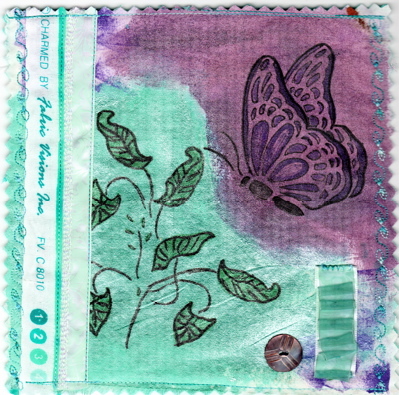 This little quiltie will be added to a butterfly theme canvas bag as a pocket. I used Lumiere paint by Jacquard in turquoise and plum. This is for a friend who loves purples and all things glitter. So I decided to try the Lumiere paint as a base, then stenciled the butterfly and leaves, coloring them in with fabric markers. I added a turquoise selvage edge, several ribbons and a button. 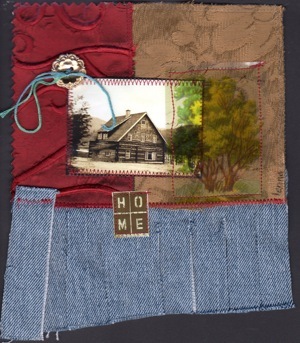 In the upper left corner, can you read the word ‘charmed’ on the selvage? That word suits my friend! This Altered Canvas bag swap should be winding down about now – bags are due back to their owners in September. But I have not seen the 11 bags I’m to work on! Looking over my past posts, I think I have only received and worked on 8 bags! Yikes! I wonder who is holding them up? I have three more bags to work on…. I know Lenna is right, we will find a new home. We will all adjust and life will continue with smiles on our faces. Thank you Lenna for the encouragement and the lovely fiber art! Now, about the Generosity Project. I have linked to Lenna’s page which explains it, but I do not know who originated the idea. I followed several links, but it seems to go on and on! (If you know the origin, please let me know so I can give credit! Thxs!) 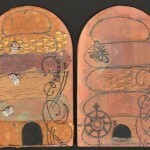 Here is how it goes: since I added my name to the draw on Lenna’s blog, I am now to offer a generosity meme on my blog. It is about making something with my own hand, from the generosity of my own little heart, and then giving that something to five people who comment about the project on this blog. The hope is that if you sign up for the drawing on my blog, or anyone else’s, you will continue the generosity meme by holding a give-a-way on your blog. Sounds fun! I I love the gift I received from Lenna so I hope I have lots of responses on my blog! I will randomly draw 5 winners next Monday, June 15th. I make no guarantees that you will like what I make. No refunds… and no exchanges!!!! What I create will be just for you, and handmade with love from me. It will be created sometime in this calendar year (2009) and sent to you, and when you receive it, you will need to let me know it has arrived. I will not give you any clue what it’s going to be. It will be something made in the real world that I’ll decorate and send to you through the US postal system. It will not be something cyber. It will be handmade, it could be any size, and it will be created from my heart in any medium I choose. I may take my time or I may make it quickly. I reserve the right to do whatever comes to mind when I create something for you! The original meme requires you to post this text (or similar) into a note/blog post of your own and then make 5 things for 5 people who respond to it. I’m not going to require that of you. If you would like to do this generosity meme too, that would be great. I encourage you to participate and generously create, but it is not a requirement in order to enter and win.” This meme does not have to be an art or craft – we are all creative in our own ways. I do hope you will join me in this! Leave a comment and I will get back with you on June 15th. You will have to leave a way for me to contact you and a mailing address if you win. 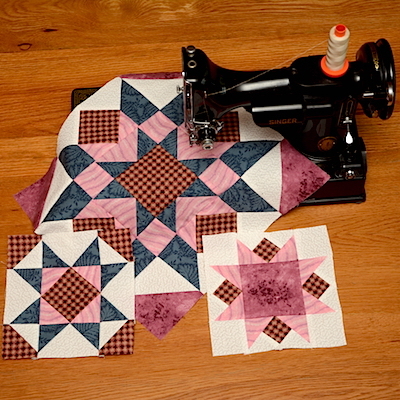 I have no idea what I will create – a quiltie? – some felted piece? – or applique? But I am looking forward to this project! Hope you join me! 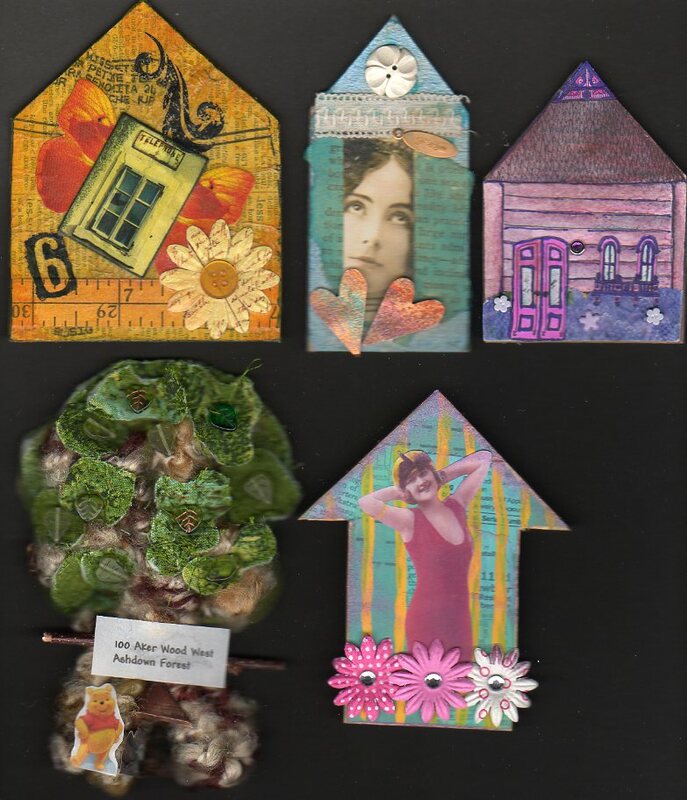 I received my lovely set of row houses in the mail September 8th from Lenna’s swap. 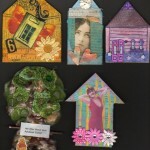 Houses are from Vickie Jones who made an ever-so-clever Winnie the Pooh tree house, Joanie Hoffman created a cottage in purples and pinks, Lisa Mallette (Studiorose) created the sunbathing beauty, Teri Calia (catnip designs) created A Taylors House – the lovely gold one, and Janice Perkin created the tall thin dream house. Thank you ladies! I love them all. I know that these houses may not be what the other ladies are expecting. 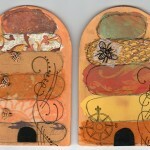 but I do hope they will like them as much as I enjoyed creating them! 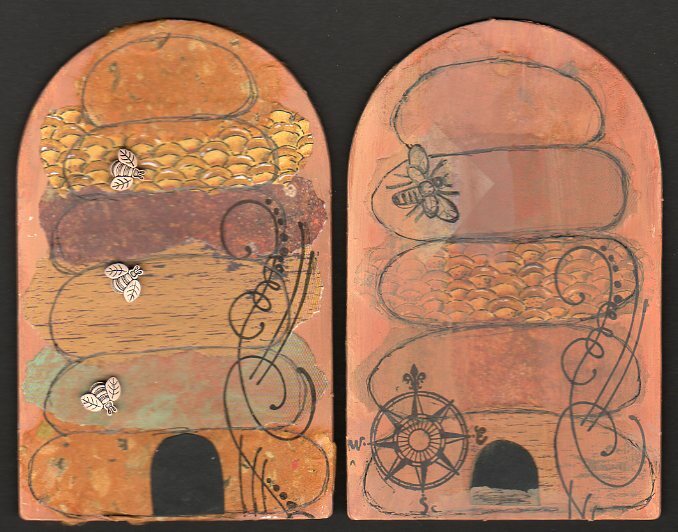 The base for the house is a chipboard Christmas tag which I painted with gesso and craft paints. 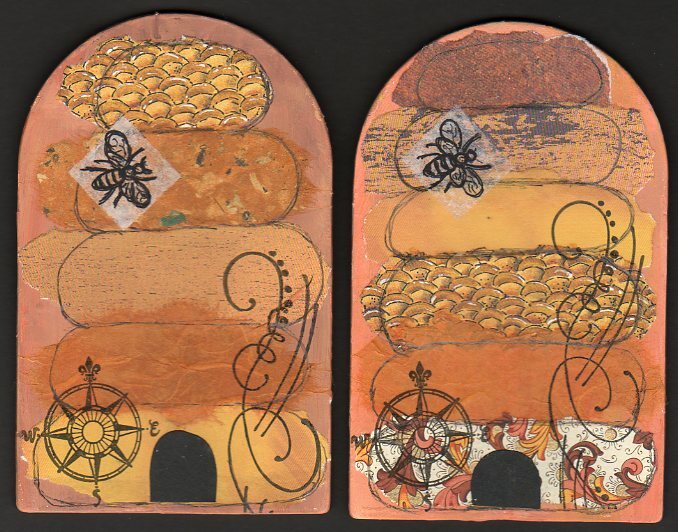 Then I added torn paper to give the woven basket shape to the hive and embellished with bees and stamping. And here is a picture of the back of two houses. I made six, so Lenna can have one. Thank you Lenna for another wonderful swap!